From left to right: Jeremy Roy of the Kentucky Farm Bureau Federation poses with first place winners from the Gatton Academy, Keeley Ruskowski, Aaron Kirtland, Caleb Stickney, Olivia Bickett, Veronica Johnson and Dorothy Anglin of Smithfield Foods. Photo by Dale Booth. 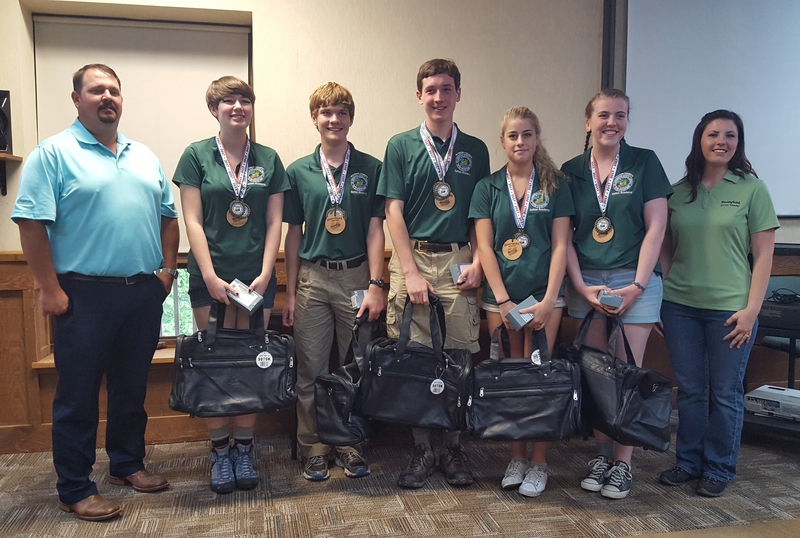 The Ten high school teams from across the Bluegrass came out victorious during a two-day state nature competition held at the Kentucky Leadership Center in Jabez, May 17-18. The teams, from Gatton Academy, Fayette County Team B, Madison Southern, Fayette County Team A, Mason County, Taylor County, Johnson Central, North Hardin, Owensboro Catholic and Mercer County, will now move on to represent the Commonwealth at the North American Envirothon competition, which will be held July 23-29, at Mount St. Mary’s University in Emmitsburg, Maryland. The 40 teams had advanced to the state level competition after successful victories at two regional competitions that were held earlier this year in April. Caleb Stickney, Aaron Kirtland, Veronica Johnson, Keeley Ruskowski and Olivia Bickett, from the Gatton Academy in Bowling Green took first place in the competition. They worked together to complete their tests and excelled in the competition. In addition to being the overall winners, the Gatton Academy team was also recognized for having the highest score in the oral presentation competition, wildlife, forestry and aquatics tests. As winners, they each received medallions for each test they won, leather weekender bags from the Kentucky Farm Bureau Federation and a Gerber Multitool from the Kentucky Division of Forestry. Madison Southern High School was the highest-scoring team affiliated with a local Future Farmers of America (FFA) chapter. Their team will represent Kentucky at the Environmental and Natural Resources Career Development event, which will take place in conjunction with the National FFA Convention in Indianapolis, Indiana in October of this year. They were also recognized for having the highest score on the soils test. From left to right: Dorothy Anglin of Smithfield Foods poses with the Madison Southern FFA team, Seth Anderson, Callie Anderson, Lauren Rowlette, Carly Mays, Ty Allen and Jeremy Roy of the Kentucky Farm Bureau Federation . Photo by Dale Booth. The two teams from Paul Laurence Dunbar in Lexington came in second and third place, with one team from Paul Lawrence Dunbar scoring the highest on the current issue test. Left to right: Jeremy Roy of the Kentucky Farm Bureau Federation poses with Paul Larence Dunbar Team B, Hannah Wang, Cici Mao , Zsomber Gal, Kelly Chen, Reka Gal and Dorothy Anglin of Smithfield Foods. Team B took second place. Photo by Dale Booth. Left to right: Jeremy Roy of the Kentucky Farm Bureau Federation poses with Paul Larence Dunbar Team A, Yoon Cho, Spandan Buch, Kevin Hutcheson, Amit Lohe, Anenth Miller-Murthy and Dorothy Anglin of Smithfield Foods. Team A took third place. Photo by Dale Booth. The Kentucky Envirothon competition has been in existence since 1999. It is sponsored by the Kentucky Association of Conservation Districts, the Kentucky Corn Growers, the Kentucky Small Grain Growers, the Kentucky Farm Bureau Federation, the Kentucky Department of Agriculture, Smithfield Foods, the Kentucky Poultry Federation, the Kentucky Division of Conservation, the Kentucky Division of Forestry, the Kentucky Division of Water, the Kentucky Department of Fish and Wildlife Resources, the University of Kentucky Cooperative Extension, the Kentucky Association of Conservation District Employees and the Kentucky Association of Conservation Districts Auxiliary.